Rectal cancer represents one third of the colorectal cancers that are diagnosed. Neoadjuvant chemoradiation is a well-established protocol for rectal cancer treatment reducing the risk of local recurrence. However, a pathologic complete response is only achieved in 10–40% of cases and the mechanisms associated with resistance are poorly understood. 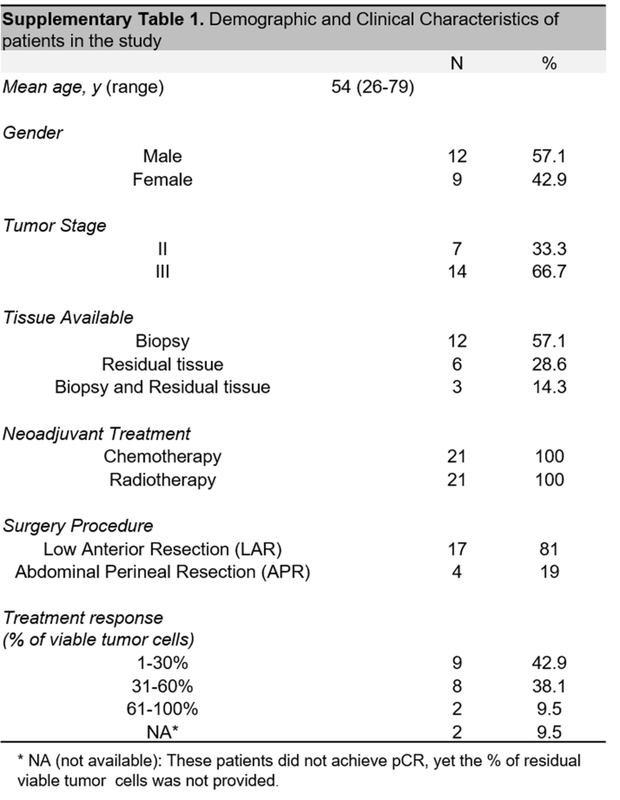 To identify potential targets for preventing therapy resistance, a proteomic analysis of biopsy specimens collected from stage II and III rectal adenocarcinoma patients before neoadjuvant treatment was performed and compared with residual tumor tissues removed by surgery after neoadjuvant therapy. 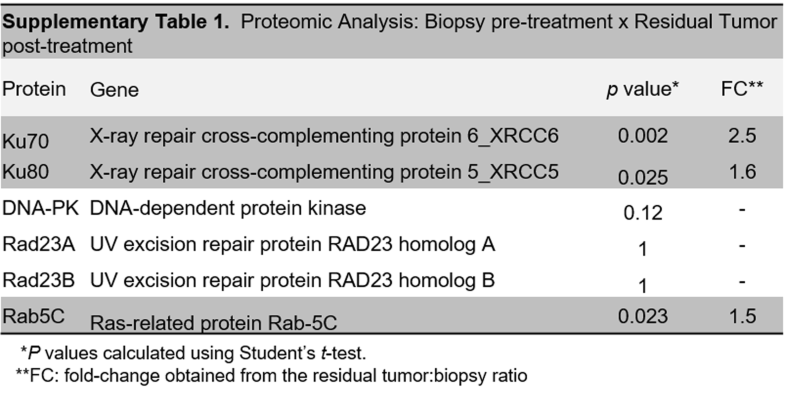 Three proteins, Ku70, Ku80, and Rab5C, exhibited a significant increase in expression after chemoradiation. To better understand the role of these proteins in therapy resistance, a rectal adenocarcinoma cell line was irradiated to generate a radiotherapy-resistant lineage. These cells overexpressed the same three proteins identified in the tissue samples. 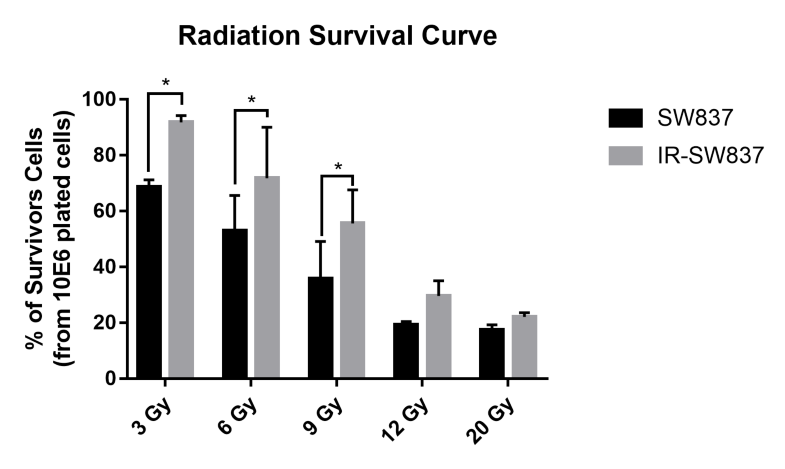 Furthermore, radiotherapy resistance in this in vitro model was found to involve modulation of epidermal growth factor receptor (EGFR) internalization by Rab5C in response to irradiation, affecting expression of the DNA repair proteins, Ku70 and Ku80, and cell resistance. Taken together, these findings indicate that EGFR and Rab5C are potential targets for the sensitization of rectal cancer cells and they should be further investigated. • Rab5C orchestrates a mechanism of radioresistance in rectal adenocarcinoma cell. • Rab5C modulates EGFR internalization and its relocalization to the nucleus. 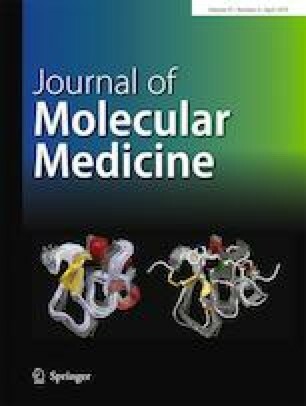 • In the nucleus, EGFR can modulate the expression of the DNA repair proteins, Ku70 and Ku80. • Rab5C, Ku70, and Ku80 are overexpressed in tumor tissues that contain tumor cells that are resistant to chemoradiation treatment. The online version of this article ( https://doi.org/10.1007/s00109-019-01760-6) contains supplementary material, which is available to authorized users. 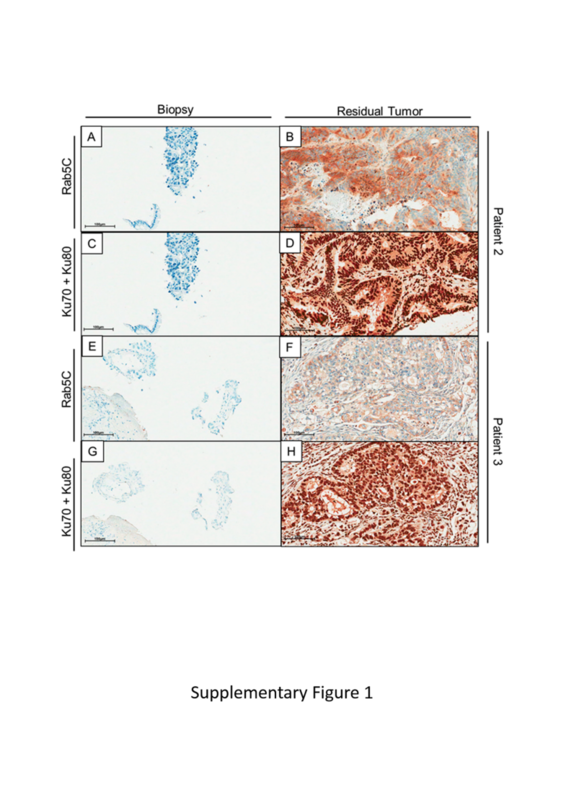 The authors would like to thank Marina França de Resende from the Department of Anatomic Pathology, A.C. Camargo Cancer Center, for help with the IHC staining. We also acknowledge the A.C. Camargo Biobank in the name of Dr. Antônio Hugo Campos and Dr. Dirce Carraro for providing great quality tumor samples and complete patient data. This study was supported by grants from the Fundação de Amparo à Pesquisa do Estado de São Paulo (FAPESP; VRM 2009/14027-2), the National Institute for Science and Technology in Oncogenomics (INCITO) and CAPES. Fellowships from FAPESP were awarded to A.R.B (2013/04913-0), M.V.S.D. (2010/19200-1), F.G (2013/23285-8), and T.C.L (2011/18718-0). ARB: Study concept and design; analysis and interpretation of data; drafting of the manuscript; critical revision of the manuscript. MCL: performed experiments and analysis and interpretation of data. MVSD: Study concept and design, analysis and interpretation of data; drafting of the manuscript. FSG: Study concept and design, analysis and interpretation of data; drafting of the manuscript. BRR: Analysis and interpretation of data; drafting of the manuscript. PPCES: Study concept and design; performed the ionizing irradiation assay. EKC: Study concept and design, analysis and interpretation of data. TCL: Study concept and design, analysis and interpretation of data. FAM: Analysis and interpretation of data; bioinformatics analysis and drafting of the manuscript. AFPL: Study concept and design, performed the proteomic analysis and interpretation of data. MDB: Study concept and design, immunohistochemistry analysis and analysis and interpretation of data. SAJ: Study concept and design; analysis and interpretation of data; critical revision of the manuscript. VRM: Study concept and design; analysis and interpretation of data; drafting of the manuscript; critical revision of the manuscript. All authors read and approved the final manuscript. This study received funding from Fundação de Amparo à Pesquisa do Estado de São Paulo (FAPESP; VRM 2009/14027-2) and the National Institute for Science and Technology in Oncogenomics (INCITO). This study was approved by the Research Ethics Committee (CEP) of A.C. Camargo Cancer Center (243.157) and all patients gave their informed consent prior to their inclusion in the study.